Oh yeah, remember this? I haven't forgotten about it, really. In fact, I'm still making progress. See? See that pretty piece of fabric clinging to the back, almost like it was made to go there? Almost as if I had crawled around on my hands and knees with a disappearing-ink marker, painstakingly tracing each piece of old fabric I'd pulled off the frame, painstakingly cut them out, and painstakingly sewed them together? See how it sits perfectly in the divot between the cushions? It's almost like the fabric was edge-stitched, then gathered by hand, then sewed together with a strip of bias tape on the back, and then the bias tape was threaded with twine, and then the twine was pulled taut and stapled at each end! I've already cut and sewed together the pieces that fit over the arms, too. And they do just that: they fit. You should've seen the hyper fit of a happy dance that ensued in my kitchen last night, after the trepedation was vanquished by sweet success. Things are coming together. Things are fitting together. This is the part of the project where I'll probably get over-confident and wreck something... but until then, this is actually fun! Oh my god, I got a little excited when I saw the back cushions. It's going to be gorgeous. I cannot wait to see how it turns out. Incredible! I am so impressed, you are doing such excellent work! Very beautiful. 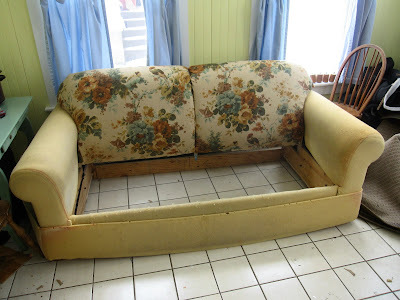 I'm sure you will enjoy this sofa for many, many years to come. Thanks guys! I'm pretty excited with the "so far" progress, too! Today I think I'll make an early day of it (snow) head home, and do more on-my-hands-and-knees cutting. Hi Kristina, it's Jen!! It says I am Joseph, but I'm not.... anyways, that fabric is gorgeous and you are incredible. I can't even imagine the hard work and patience this must require!!! You amaze me. Thanks for chiming in, Jen! Henceforth, I will know that you are Jen, and not Joe. :) Glad you like the fabric-- so far I've managed not to cut any upside-down-bird pieces! Kristina! You are amazing! Can't wait to see how you put the seat back in. Becky-- lucky for us, it's a sofabed. To remove the under-seat part, all you need is a little bit of patience and the appropriately-sized allen wrench! Hopefully it'll fit back together with a minimum of fuss-- provided, of course, that we didn't lose the screws!